A follow on workgroup has been created to implement and expand the outputs further. This workgroup is: The Scholarly Link Exchange Workgroup. Building on pre-existing components and international initiatives, this WG was focusing on a one-for-all cross-referencing service for the links between data and publications. The challenge for the working group has been "How to move from a plethora of (mostly) bilateral arrangements to a one-for-all service model infrastructure for the research data publication landscape?" For more details on the working group see our 2-page overview. The 1st stage of the demonstrator service is now available. Feedback welcome! 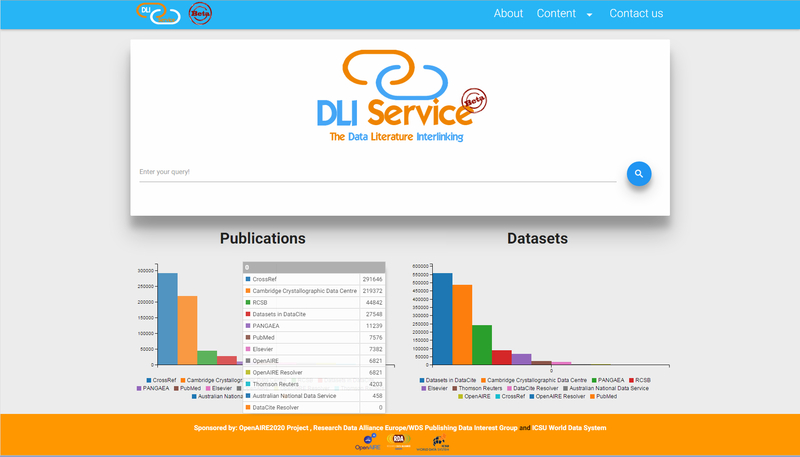 There are now millions of objects in the system from a variety of journal publishers, data centres, and research infromation services. See the latest statistics here. You can be part of Scholix by simply providing a file with the publication-data links from your system! Just contact us. The next stages of the demostrator service is embedded into the follow on working group. How would you use such a system? To inform optimisation of the query and access interfaces, further detail is now sought on end-user scenarios. Why not make sure this system is designed for your needs! In parallel to the systems development the Working Group is also starting to consider a broader framework of standards, quality, and coordination. Below the official confirmation message. Thank you for your patience.